Dance Music of Ireland is the most popular collection of Irish music everr published. 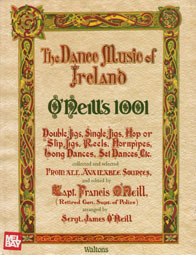 These 1001 melodies were written down by Captain Francis O'Neill and arranged by James O'Neill. Included are 365 Double Jigs, 45 Single Jigs, 45 Slip Jigs, 350 Reels, 150 Hornpipes, 30 Long Dances, and 16 Miscellaneous Forms. PUBLIC DOMAIN STATUS: This Mel Bay Publications edition appears to be an unabridged and unaltered replication of the work originally published by Lyon & Healy, Chicago, in 1907. All of these melodies were published in 1907 and are believed to be in the public domain in the United States. A photocopy of the Title Page with Copyright Notice is included with each book to prove public domain status since Mel Bay did not include copyright information in this reprint edition. 16	When Sick is it Tea You Want? 33	Do You Want Any More? 104	Will You Come Home With Me? 125	Wasn't She Fond of Me? 139	How Are You, Kitty? 293	How Much Has She Got? 299	Be Easy You Rogue! 302	What Sounds Can Compare? 376	Is It the Priest You Want? 421	"My Mind Will Never Be ""Aisy"""
652	Molly What Ails You? 695	Girls, Who Will Take Him? 866	Whiskey, You're the Devil! 930	Where Did You Find Her?